That was between thir twae. And all because he would not listen to the warnings of a mermaid, but deliberately cut her head off. There is no such pausing, no such description, as would infer a doubt of the reality of any folk in the story. The point is, not to convey the fact that sea- maidens exist, a truth of which every listener is aware, but to prove the folly of disregarding their advice when they warn us against going to sea in bad weather. The region to which we are introduced being that of tradition, not of history, we must have plenty of faith if we wish to be happy there. Everything we see is colossal, things as well as men being fashioned on a mighty scale: the adventurous nature burns fierce as fire, lives fall thickly as leaves in harvest, and the heroes sweep hither and thither, strong as the sword-blow, bright as the sword-flash. Two powers exist—physical strength and the command of the supernatural. Again and again, however, we leave the battle-field, and come upon ‘places of nestling green,’ where dwell those gentler emotions which belong to all time and are universal. We have love-making, ploughing and tilling, drinking and singing. At every step we meet a beautiful maiden, frequently unfortunate, generally in love, and invariably with golden hair. Among the pieces founded on popular superstition, appear, as has been suggested, many of the gems of Danish ballad literature. In nearly every one of them we hear of enchantment, of men and maidens transformed into strange shapes; and it is remarkable that the worker of the foul witchcraft is invariably a cruel stepmother. The best of them are terse and strong, and impress us more solemnly than do the ‘Battle Ballads.’ We are in a strange region, as we read;—and everywhere vi around us rises the wail of people who are doomed to visit the scenes of their humanity in unnatural forms. Of the large mass of ballads dealing with ordinary sorrows and joys consequent on the domestic affections, it is unnecessary to offer any description, since they form the bulk of the pieces here printed. The longest and best of them all is ‘Axel and Walborg.’ This exquisite poem has been for centuries popular over all Scandinavia; places innumerable claim the honour of possessing Walborg’s grave, and rude pictures of the hapless lovers are scattered far and wide among the cottages of the North. As a picture of manners and customs alone, the ballad is priceless. Note, for example, the ecclesiastic ceremony, wherein the rascally Prince Hogen plays so black a part. In addition to a selection of old ballads, I have given, for the sake of variety, a few modern pieces, by Oehlenschläger and others. Out of the numerous originals, I have selected for the present purpose those which seemed the purest and best, passing over with reluctance several viii fine specimens which had been well rendered by previous translators. 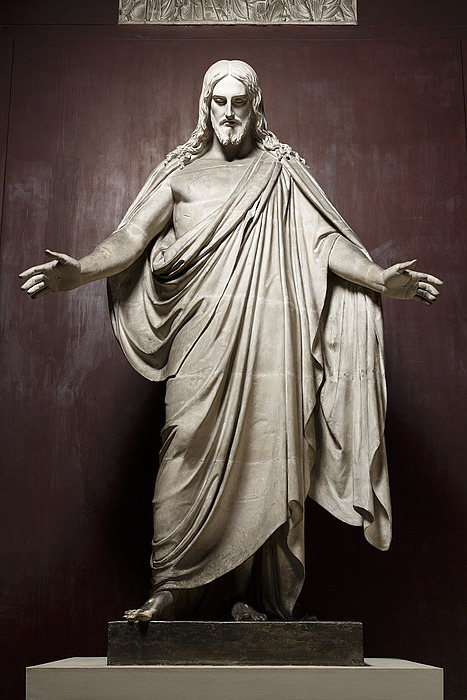 My task, on the whole, has been one of no ordinary anxiety. Next to the difficulty of writing a good ballad ranks the difficulty of translating a good ballad, and very few men have succeeded in doing either. Had I consulted my own taste, and translated throughout in broad old Scotch (the only really fitting equivalent for old Danish), I should not only have hopelessly bewildered English readers, but have laid my efforts open to dangerous comparison with those of Jamieson. * I have, therefore, done the best I could in the English dialect, using Scotch words liberally, but only such Scotch words as are quite familiar to all readers of our own ballads. * Robert Jamieson, who, among his ‘Popular Ballads,’ published in 1806, gave five from the Danish, rendered with a rugged picturesqueness transcending the best efforts in that direction of Scott himself. This Jamieson was a veritable singer, and struck some fine chords from a Scotch harp of his own. And chucked her ’neath the chin! ‘God save thee, foster-mother dear! AXEL AND WALBORG; OR, THE COUSINS. Follow thy sons! stand by her side! Wildly the dancers twirled and skipt.’ (Frontispiece.) A. B. HOUGHTON. 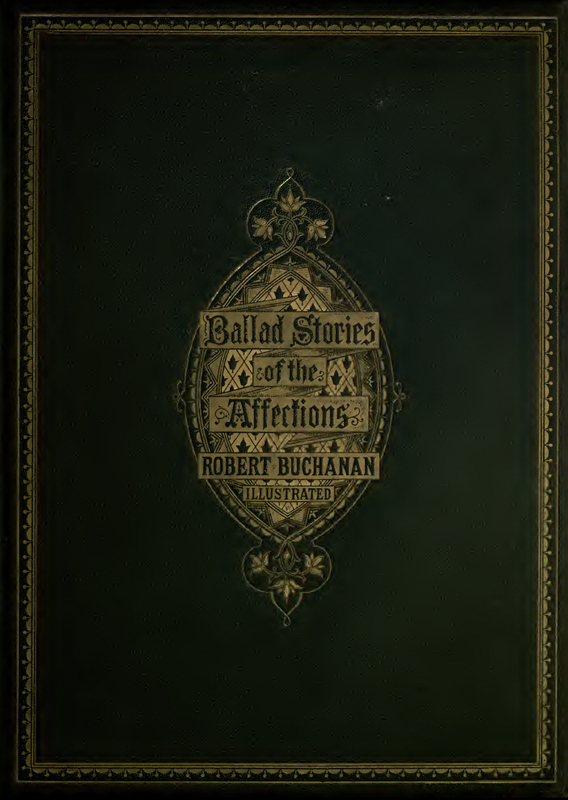 The illustrated edition of Ballad Stories of the Affections: from the Scandinavian was published by George Routledge & Sons in December, 1866. 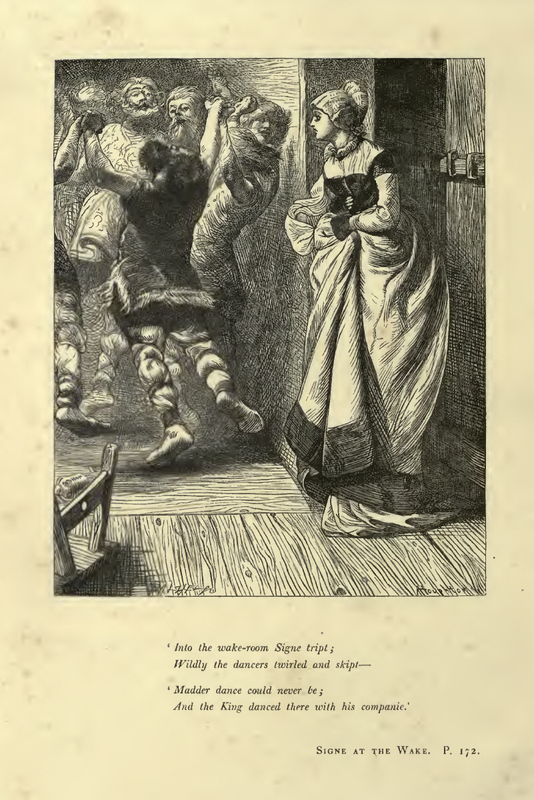 In 1869, a cheap edition, minus the illustrations, was published by Sampson Low, Son, and Marston (London) and Scribner, Welford and Co. (New York). The motto on the cover of this edition,"The stretched metre of an antique song" is taken from Shakespeare’s Sonnet 17. Keats also used the line as the epigraph to Endymion: A Poetic Romance (1818). * Udvalgte Danske viser fra Middelalderen, efter A. S. Vedels og P. Syvs trykte Udgaver og efter Laandskrevne Samlinger udgivne paa ny af Abrahamson, Myerup, og Rahbek. (Copenhagen, 1812.) 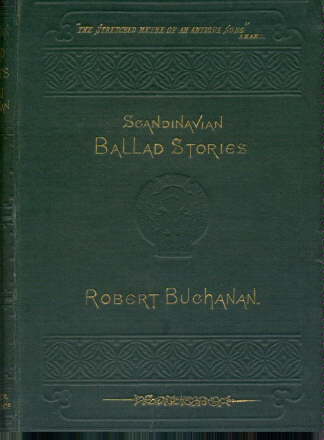 Such is the title of the work from which most of the antique ballads here translated have been taken; but numerous other collections—Swedish, Norwegian, and Danish—have been referred to and used. The modern pieces by Oehlenschläger are to be found among his collected poems, in the editions published at Copenhagen. Those by Hoëdt and Bögh are taken from a little miscellaneous collection of verse, edited by Ingemann, and picked up by me for a trifle at a Danish bookstall.—R. B. The Latin quotation, “In nova fert Animus mutatas dicere formas Corpora,” in the Preface is the first line of Ovid’s Metamorphoses - “My mind leads me to tell of forms changed into new bodies ... ”. The November, 1866 edition of The Argosy contained two poems from Ballad Stories of the Affections - ‘Agnes’ by ‘R. B.’ (‘after Oehlenschläger’), ‘The Lead-Melting’ by ‘Robert Buchanan’ (with no indication that it was a translation) - and there was also ‘Convent-Robbing’ by ‘Walter Hutcheson’, which was a complete reworking of the story of ‘Cloister Robbing’. Buchanan also included ‘Agnes’ at his second Reading at the Hanover-Square Rooms on 3rd March, 1869. 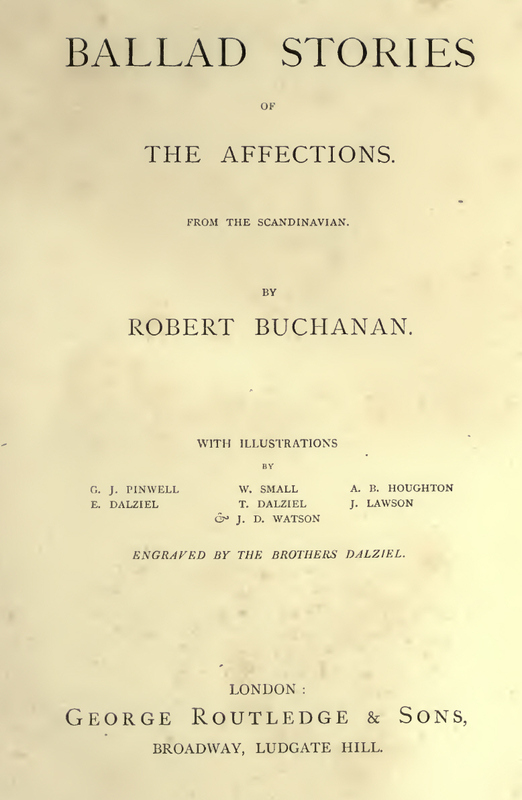 None of the poems in Ballad Stories of the Affections: from the Scandinavian are included in the 1884 edition of The Poetical Works of Robert Buchanan (although ‘Convent Robbing’ is in the ‘Early Poems’ section). 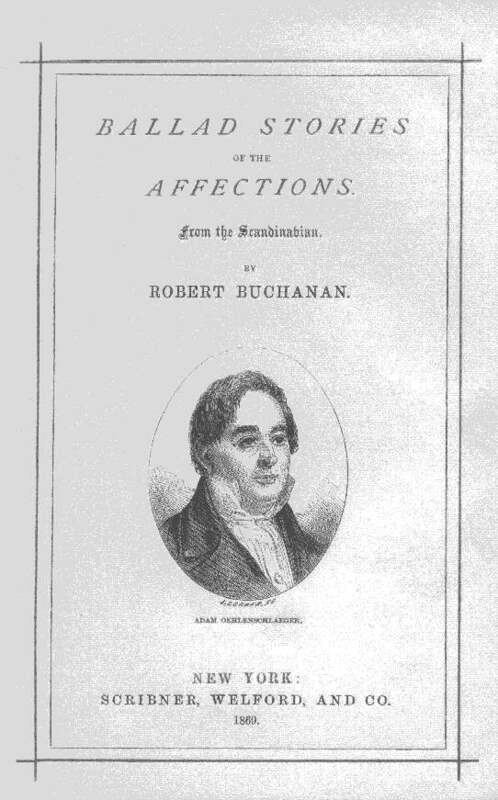 However, one poem, ‘The Lead-Melting’ was included in The New Rome (1898) and was also included in the 1901 edition of The Complete Poetical Works of Robert Buchanan, with no indication that it was a translation of the work of Claudius Rosenhoff. The Second War of Schleswig lasted from February to July 1864. Further details of the conflict are available on wikipedia.